Just had my knuckles done after about a year of thinking! my mom and stepdad just split after 20 years together, and my stepdad was the one to introduce me to STAR WARS, so this is my way of showing him that he will allways be a big part of me even now that his not with my mom. The Story behind is that i already had the Stars on my left and right hand. They weren`t made that good and i thought about having them made over and use the star for the A in the Word STAR, and on my other Hand ROCK to build the Word ROCKSTAR. I was more into it when i read KAT von D`s Book cuz i liked her hands so much. Now im Happy to have it on my Knuckles. I am the bass player for south florida’s Deadstar Assembly. 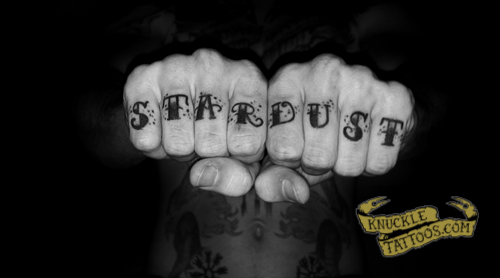 In this email I have attached a photo of my knuckle tatt which reads “Rock Star”. A bunch of fans have been emailing me asking me to submit my photo to this site, so I figured I’d finally take a picture and send it in. Hope it goes to good use. You can check us out at deadstar.com and myspace.com/deadstarassembly.